McKim, Mead & White is best known for its grand Beaux-Arts designs, but here the architectural firm created an Art Deco gem. This low-rise retail building was erected originally for Louis Sherry, who had had a famous restaurant on Fifth Avenue at 44th Street from 1898 to 1919. In his book, "Touring the Upper East Side, Walks in Five Historic Districts" (The New York Landmarks Conservancy, 1995), Andrew S. Dolkart remarks that the restaurateur blamed "prohibition and war-born Bolshevism" for the closing of his restaurant," adding that "An eating establishment with Sherry's name was revived following his death when this stylized Neo-classical building, inspired by contemporary French commercial design, was opened to the public." "The large plate-glass windows," Mr. Dolkart continued, "were planned to draw the attention of passersby to the elaborate displays of gourmet foods sold in what was called the 'table luxury shop.' Behind the store were a tea room and ice cream parlor and a balcony restaurant. In 1984-85, the Limited clothing chain hired Beyer Blinder Belle to restore McKim, Mead & White's building and construct a rooftop addition. The original building received an award from the Fifth Avenue Association in 1929 and the restoration has won several design and preservation awards." 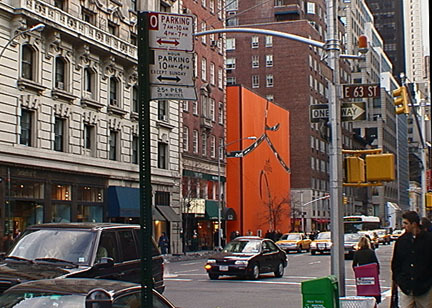 In 2000, the store underwent another renovation to become the New York showcase for Hermès, the French fashion company, which moved from 57th Street between Fifth and Madison Avenues. During construction, the building was stylishly, not surprisingly, enclosed in the store's orange box with brown ribbon. The building is a landmark and the renovation did not change the exterior except to add a sprightly uniformly Frenchman astride a rearing house carrying flags at the pinnacle of the building. The renovation of the interior by Hèrmes was quite spectacular with a spiral staircase leading up to the skylit top floor.